They came in their thousands, young and old, men and women, all marching along the ring road that encircles the Nepalese capital, Kathmandu. 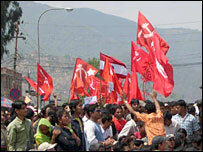 Tens of thousands of Nepalese had planned to attend a major opposition rally in protest against the king. Instead, they found themselves rallying for victory. The king's late night announcement that he was restoring the country's parliament has been welcomed by the political parties which on Tuesday named veteran leader Girija Prasad Koirala as their candidate for prime minister. "The new parliament will meet on Friday, an interim government will be formed and we will pass resolutions on beginning a dialogue with the Maoist rebels as well as holding elections to a constituent assembly," Communist Party (UML) leader Madhav Kumar Nepal told the BBC. However, in a strong statement, the Maoists rejected the king's move and said by welcoming the royal proclamation, the parties were making a big mistake. Senior Maoist leader, Baburam Bhattarai, told the BBC Nepali service that merely restoring the parliament was not going to resolve the problems and that the rebels planned to continue fighting against government forces. The Maoists and the seven party opposition alliance struck a 12-point agreement last year, which included agreeing to set up an interim government and a constituent assembly. The Maoists control vast swathes of the countryside and are also heavily armed, one reason why they command a high degree of influence. Many people also believe that the Maoists have not given up on their goal of turning Nepal into a communist republic. Not surprisingly, the mood on the streets of Kathmandu is mixed. While there is an overwhelming sense of relief that the protests have come to an end, many feel that merely restoring parliament is not enough. The neighbourhood of Kalanki, in the south-east of the capital, has been one of the flashpoints of the rallies - three protesters were killed here last week, shot dead by police. Some 20,000 protesters gathered here on Tuesday, chanting and cheering. But in a reminder of the violence that had taken place, many in the crowd held posters and placards with pictures of the dead men. "We want justice for those who have died," said one protester, Madhav Gurung. "The police commander who ordered the shooting must be arrested and tried," he said. 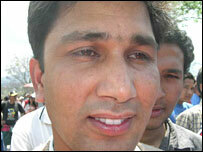 Bikash Sharma, 29, teaches English at a local college. He said the protesters would not be satisfied until the king was overthrown. "A constituent assembly is needed so that we can have the people's mandate. The king must be replaced by the people's man." While many welcomed the appointment of a new prime minister, others warned that the political parties should not squander the opportunity. "The politicians should not fight among each other as they have in the past and try and pursue personal agendas," said another protester, Gyanendra Bhattarai. "GP Koirala needs to improve on his previous performance," he said. Mr Koirala has been prime minister on three previous occasions but Nepal's experience of democratic government has been an unhappy one. The country has had 13 prime ministers since parliamentary democracy was introduced in 1990. Internal bickering and political rivalries meant that all the prime ministers were unseated by rivals before they had completed a term. Moreover government corruption was seen as a widespread problem by Many Nepalis. Elsewhere in Kathmandu, the city burst into life as many people came out on to the streets for the first time since the protests began. Shops buzzed with customers and traffic clogged the city's once-empty streets as many residents simple wandered around. "I'm so glad to be out finally after 20 days of protests," said Kruttika, 17, shopping with her friend Surbi. "We want peace, but most of all we want normal life to return," said Surbi. In Kathmandu's Darbar Marg, a broad avenue that leads to the palace and is flanked by trendy shops and businesses, two men were scathing in their criticism of the protesters. "The whole thing has been orchestrated by the Maoists," said one of them, declining to be named. "The political parties will be unable to fight the Maoists and the situation is going to get much worse." His friend added: "If the king hadn't taken control we would have become a Maoist republic by now." Some analysts believe the reaction of the Maoists has already created hurdles for the incoming government, which will have to work very hard to take the rebels into its confidence. But others said the Maoists' statement was just rhetoric for public consumption. "The statement should be seen partly as a bargaining position. The Maoists are preparing to negotiate from a position of strength," says Rhoderick Chalmers, South Asia analyst with the International Crisis Group. And while there appears to be a strong current of republicanism flowing through Nepal, many feel that there is definitely a place for the king in the country's polity. "The king has made a very humiliating climb-down," says Mr Chalmers. "But the palace will bounce back."